If you were a teenager 15 years ago, your definitive Romeo and Juliet were definitely Leonardo DiCaprio and Claire Danes. If you were a teenager 25 years before that, you were all about Leonard Whiting and Olivia Hussey from the 1968 version of the story. Now this Tumbl'd and Twitter'd generation of teens is getting their own tragic love story, with this new adaptation of Romeo & Juliet starring up-and-coming youngsters Hailee Steinfeld (an Oscar nominee for True Grit a few years back) and Douglas Booth. The film's first trailer has just debuted, at MTV naturally, and you can also catch the poster, which premiered at Teen Vogue. Don't ever say the people behind this movie don't know their target audience. As a classic obnoxious Millennial who can't get over my 90s nostalgia, I have to feel sorry for these modern teens, who don't get to see Romeo & Juliet with a drag queen Mercutio and Leonardo DiCaprio's to-die-for (literally!) Hawaiian shirt. I don't totally know what good a straightforward adaptation of Romeo + Juliet is at this point, except to recognize that many of the kids at whom this movie is aimed might not even know the story, so the idea of "another Shakespeare movie in olden times" might not exhaust them. Though they still might get a gander at Joss Whedon's inventive Much Ado About Nothing and still figure out what they're missing. 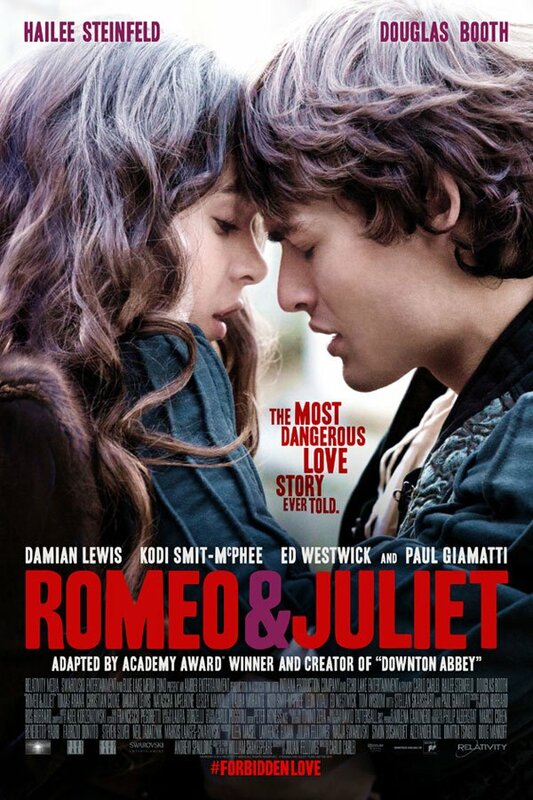 The new Romeo and Juliet is due in theaters October 11. Pack your tissues accordingly.